Zucchini is one of the most versatile vegetables. You can make it into pasta, grill it on a skewer, stir-fry it, or simply eat it raw [a squeeze of fresh lemon over top is a treat]. 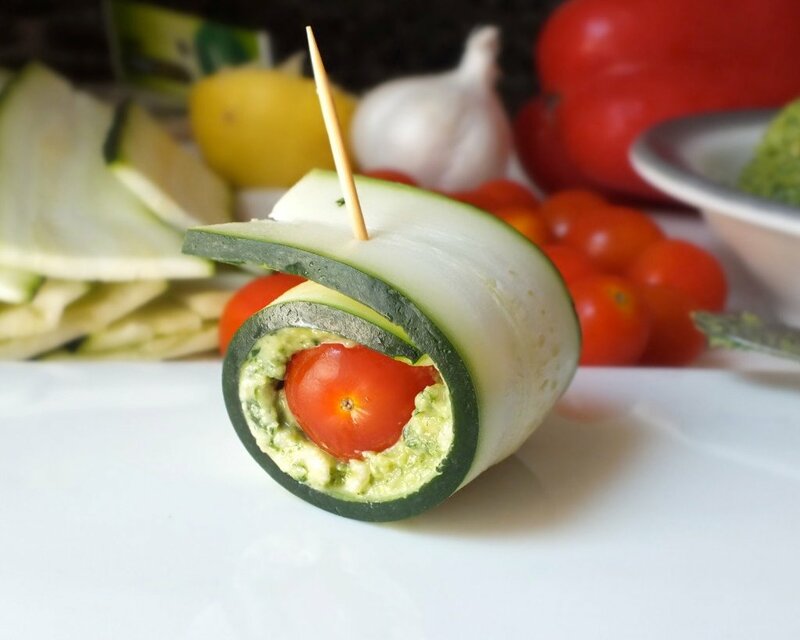 As it turns out, zucchini can also make quite a sophisticated appetizer with minimal effort. And pesto… oh, pesto. A delicious mingling of what are arguably some of food’s best flavors. 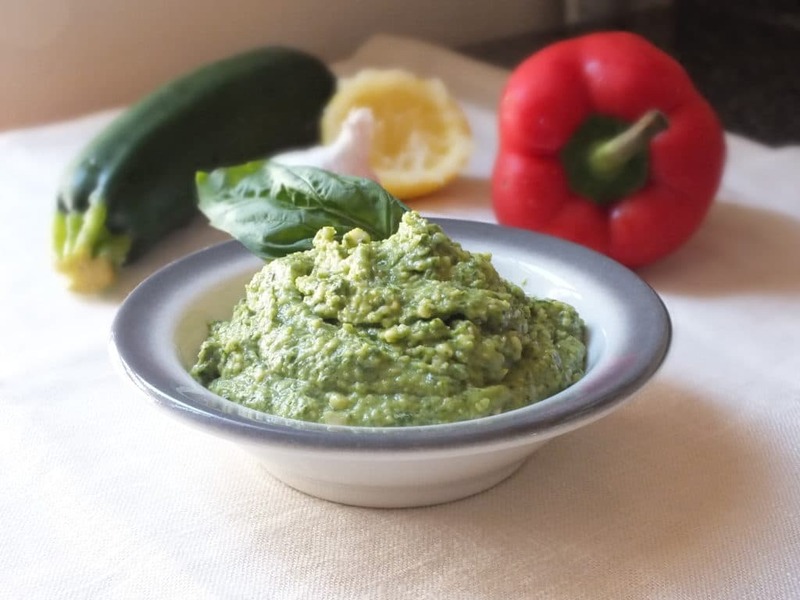 All it takes is basil, a handful of cashews, lemon, and garlic to create a mouthwatering pesto. Pine nuts seem to be the go-to for most pesto recipes, but cashews work just as well and cost much less [stick around here long enough and you just might learn something]. This appetizer requires little prep and process which means you can make lots of these very quickly. And then watch them disappear off the table just as fast. These suckers are like Pringles – in the sense that once you pop one you can’t stop. 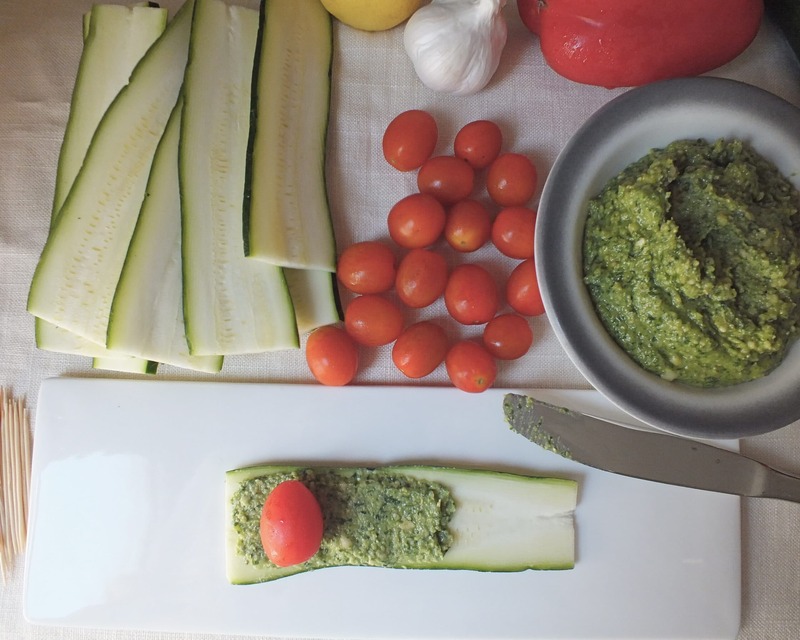 Start off by making the pesto – mainly because it becomes more flavorful the longer it sits. Combine cashews, olive oil, basil, garlic, lemon juice, nutritional yeast, salt, and pepper in a food processor. Pulse until the consistency is mostly smooth. Cover and refrigerate. Chop the ends off each zucchini. 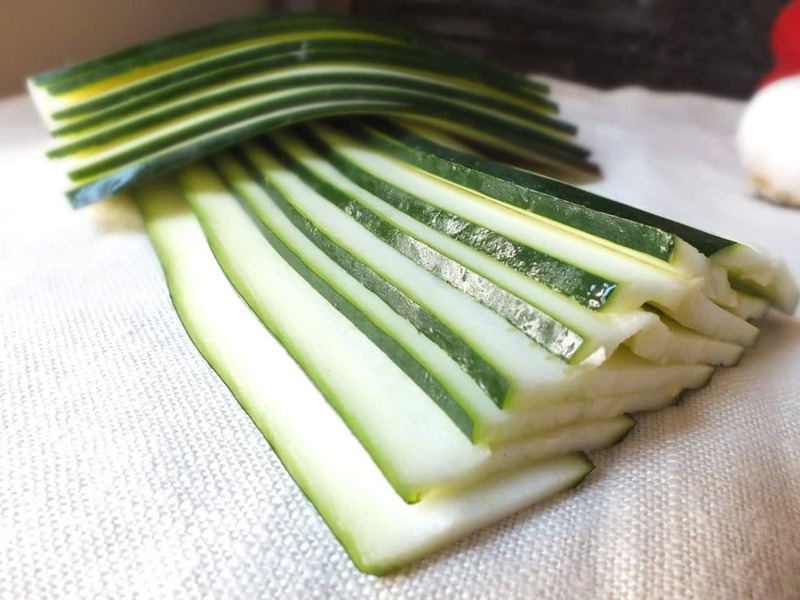 Then, using a mandolin or vegetable peeler, start peeling long strips from the zucchini. Repeat until you’ve peeled enough strips for the amount of rolls you want to make. Have the cherry tomatoes ready in a bowl and a stockpile of toothpicks. On a flat surface, lay out a slice of zucchini, portion a spoonful on the strip and smooth it out evenly. Cover 1/2-3/4 of the strip, otherwise it will be hard to roll and the pesto will ooze out everywhere. Place a cherry tomato near one end of the zucchini and start to roll the strip around the tomato. When you get to the end, spear the roll with a toothpick and set it aside. Repeat the process until you run out of ingredients. If you have some pesto left over [exciting! ], it will keep in the refrigerator for 2-3 days. To be honest, ours didn’t last that long because we dipped whatever we could find in it until it was gone. The stuff is so good it’s bad. Simple, cute, and irresistible. What more can you ask for in a snackatizer? 1. Combine cashews, olive oil, basil, garlic, lemon juice, nutritional yeast, salt, and pepper in a food processor. Pulse until the consistency is mostly smooth. Cover and refrigerate. 2. Chop the ends off each zucchini. Then, using a mandolin or vegetable peeler, start peeling long strips from the zucchini. Repeat until you’ve peeled enough strips for the amount of rolls you want to make. 3. On a flat surface, lay out a slice of zucchini, portion a spoonful on the strip and smooth it out evenly. Cover 1/2-3/4 of the strip, otherwise it will be hard to roll and the pesto will ooze out everywhere. 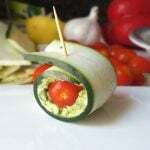 Place a cherry tomato near one end of the zucchini and start to roll the strip around the tomato. When you get to the end, spear the roll with a toothpick and set it aside. 4. Repeat the process until you run out of ingredients. Made them without the nutritional yeast & they were delicious. I used a peeler to make thin slices of zucchini. Had enough pesto left to make more for a baby shower on Tuesday. They’ll be a hit. Thanks for letting us know how they turned out. They’re a huge hit at parties! Thank you for making this recipe printer friendly. Just printed it & plan to make them for guests tomorrow. What is “nutritional yeast”? Never heard of it. Wow! love your recipes. I made these last night and they were fantastic! I made the first few zucchini slices thicker and then made the rest thinner — the thinner were easier to eat. They were delicious!! Thank you!! I would REALLY like to copy this recipe but don’t want all the pictures. Do you have a format with JUST the recipe? I’m really interested in making pesto as I have an abundance of basil. Your recipe sounds SO good. We are currently in the process of adding recipe cards to each of our recipes! I just finished this recipe so you should be able to print out a single page card without pictures :). Thanks for visiting! Enjoy! i dont have raw cashews on hand, would roasted and salted cashews work instead? thanks! That will work just fine! You might want to 1/2 the salt in the pesto since the cashews are already salted. is there a way to have your recipes formatted to fit or print out on a smaller 3 x 5 card instead of sometimes multiple sheets, and in black ink instead of blue or other???? We’re working on implementing that! It will be a feature very soon. The recipe calls for 1 tbs. nutritional yeast but no place in the instructions is it added. What good does this give to the recipe IF I add it & when? Oops, looks like we forgot to write that in…the nooch just goes in with the rest of the ingredients in the food processor. It adds a salty, savory flavor. We’ve made it with and without, and definitely recommend using it :). always looking for more vegan rec. You’re in the right place! 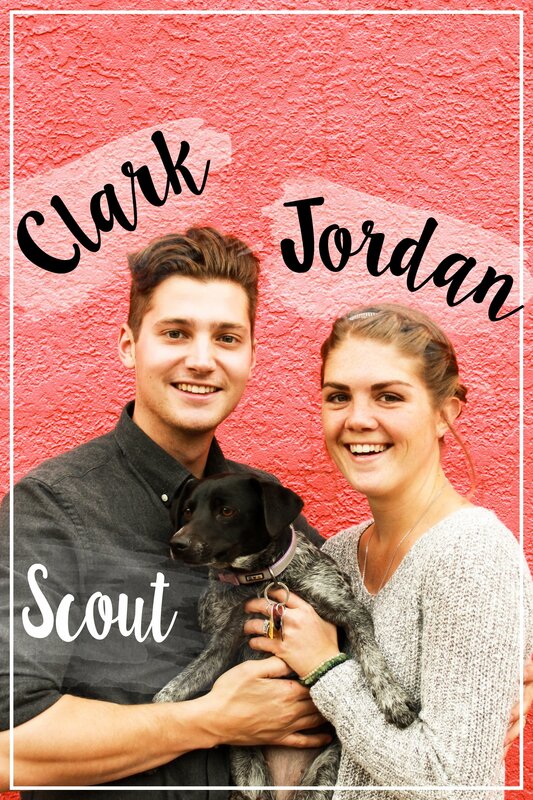 We post 3 recipes per week! What a great idea! The pesto sounds so tasty, too! I am allergic to tomatoes, so what could I use instead? I also avoid all nightshades, corn, soy. That’s a tough one. Nightshades make up a huge percentage of vegetables… Perhaps mushrooms would work as a substitute? So pretty! Which type of mushrooms would you recommend (if needs to be cut, what size)? Also, if one can’t have citrus fruit/juices, what can one use instead of lemon juice? These were great! I served them at a pot luck. Next step . . . My niece’s groom’s dinner. I found that using grape tomatoes and putting the pesto down the middle of the strip helped to not ooze out the sides. I’m doing them again for my niece’s bridal dinner. I found it easier to use grape tomatoes and only place the pest in the middle, when rolling up, everything spread out without falling out the edges. ZUKES! 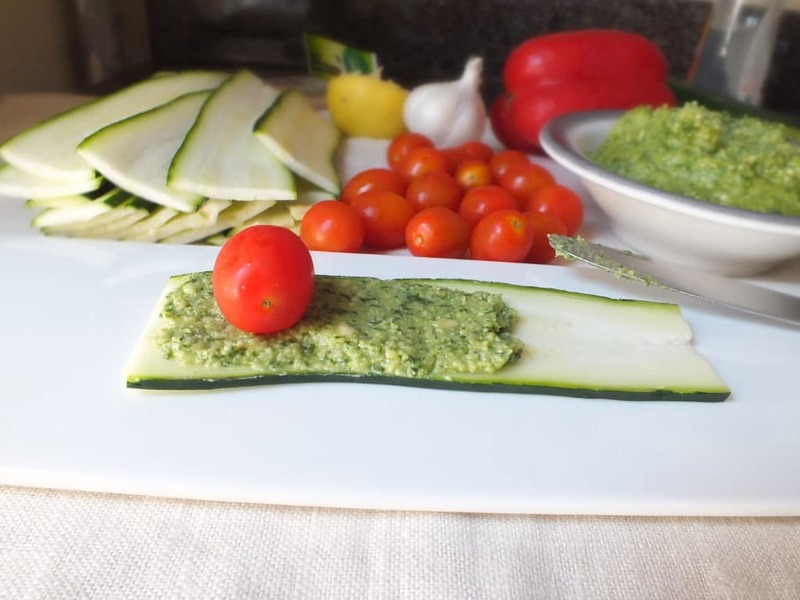 Zucchini Bruschetta and More Green Ideas - Bring It!